Budgeting. In some of our lives, it's known as "the b-word." If you've never budgeted before, it can seem like a gargantuan task that only produces something that will make you miserable. And if you consider yourself bad with money or find that you have a difficult time living within your means, budgeting can feel like one more way to fail financially. But budgeting doesn't have to be any of these things. It doesn't have to take a lot of time and energy, and it can free you so that you can save for the things that you really want. It can also help you understand why you spend the way you do, and help you get a handle on it. Recording your transactions won't help if you never think about them. Learn to categorize your transactions in whatever way is meaningful for you, so you can see how much you're spending in different areas. This can help you decide where to spend more, where to spend less, and what cutting back might look like in your everyday life. 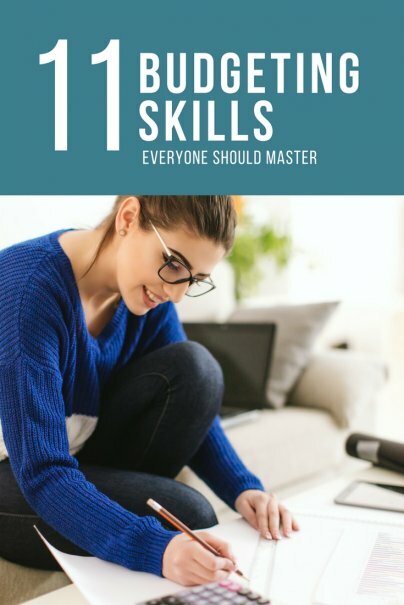 This might be the most obvious skill in this list, but it's also one of the most important. There are spreadsheets you can download, programs like YNAB and Mint that help you see your spending in different ways, and more. Some things to think about before you choose a method involve deciding whether you want to go old school or online, and whether you want to store it on your personal computer or in the cloud. Throughout the budgeting and recording process, it will help if you actually write things out. This can be on a computer, though there is something about the act of writing something and then seeing it there in your own handwriting that helps you remember. Whatever you do, don't keep your budget in your head. It's easy for numbers to become fuzzy and for you to forget about your budget entirely. Instead, put your budget where you can see it often, so that it feels real and you remember your goals. When you make your budget, don't just think about what you need right now, or even your monthly expenses. Think, too, about expenses that only come around every so often. Car insurance, life insurance, and property taxes are a few line items that can fall into these categories. Then, save a little bit of money every month toward these items, so you can pay them without worry when that bill shows up. If you don't have spending money, you will feel like your budget is a cage you need to break out of, rather than a structure supporting you and your goals. Even if all you can afford is $5, give yourself something. This can go against the grain, especially if you have a lot of debt or very little income. However, you are important. And you will be happier keeping your budget if you know you have a little money you can spend however you want. It's easy to get sucked into a system that doesn't work for you. For instance, you may not be able to track your spending every day. If that's you, then don't buy into a budgeting system that requires this. There are plenty of systems where you can record once a week, or so. If the system doesn't work for you, you won't do it, and there won't be any value to budgeting. Keep trying things until you find something you like. This is a huge skill and one that won't happen overnight. Living a disciplined life, though, will go far toward helping you make and keep your budget. Pay attention to your budget. Update it. And when you don't have any money left for something, stop spending! It can help to breathe through your desires, to remind yourself of your bigger goals, and to give yourself a waiting period before you buy things. This is a tricky skill, especially in light of the one above. However, there are times in every life when it's right to splurge. This doesn't have to be a huge spending binge — it can be something as small as a coffee with a friend. A lot of times, this comes into play when you choose to buy something of a higher quality even though it costs more. It's up to you to decide when to splurge, but make sure there's some room for it in your financial life. When you're budgeting alone or you are the one in charge of the budget, it can be easy to let things slide. Get into the habit of asking yourself hard questions, like, "Why do I always spend too much on entertainment?" and "Am I realistically able to take that vacation this year?" You may not like the answers you find, but being honest with yourself will ultimately help you become more aware of who you are and how things work inside of you — which will help you meet your goals, financial and otherwise. Are there any other budgeting skills that are important to you? Which ones are they? Agree with all you mentioned, specially number 7. When we were first married, we had 25 cent mac and cheese from a box 2 -3 times a week. Blow money does seem counter intuative when you have school and medical debt hanging over you, but even our small allowance maintained our sanity. DH could have a canned soda once and a while, and I could gather together yard sale money to buy pretty stuff for the house. It humanized our situation. And even though we never did it, we felt, if things get REALLY bad we have some wiggle room by eliminating the mad money.